Imagine a driving game that takes on the form of a visual novel. That’s loosely what Wheels of Aurelia is like; the pointed summary is that it doesn’t really align with any traditional video game experience at all. Even within the context of an indie title, this one is as art house as they come. It’s not going to appeal to everyone, and it’s far from being suitable for all ages. Unlike other titles we’re more used to seeing released on a regular basis on Nintendo’s eShop, this is likely to only appeal to a very niche audience. Using the term “game” to define Wheels of Aurelia is admittedly misleading; this is an interactive visual novel at best. Even without touching a single button you’ll eventually see the credits roll within 10 to 15 minutes. Fortunately, if you’re feeling at a loss at this point, there are 16 different endings that can be unlocked over time in an attempt to maximise the replay value. 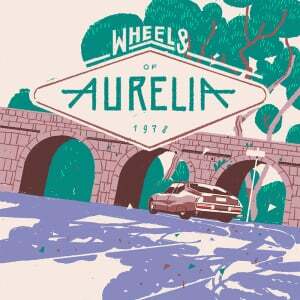 Set in Italy during the late 1970s, Wheels of Aurelia places you in the shoes of Lella, a “bold” and “spunky” woman (according to the official description, anyway) on an immersive road trip through the western coast of Italy. The player experiences this “tumultuous” period – dabbling in every topic from politics, history, religion, sexuality, women’s rights and even terrorism – from Lella’s perspective, experiencing the sights and sounds while uncovering events from her past and meeting friendly (and not-so-friendly) people along the way. The title itself is derived from the Aurelian Way, a Roman path constructed on the route now occupied by Strada Statale 1. 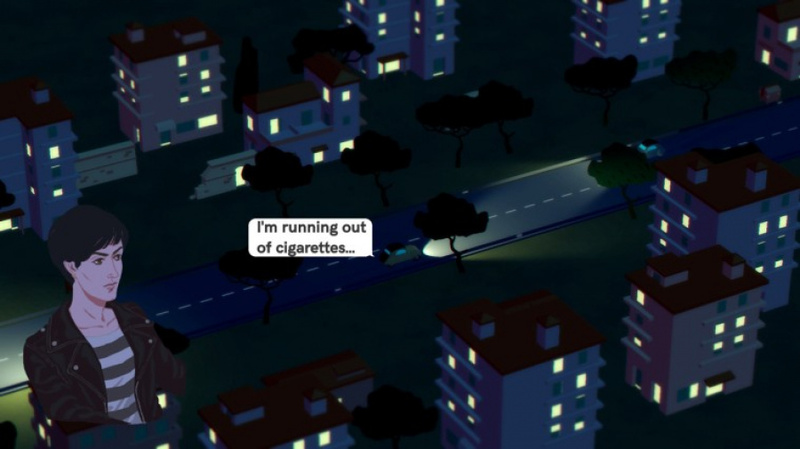 Every action in Wheels of Aurelia is driven by interactive story-telling. Dialogue dictates how each journey unfolds. These verbal exchanges occur between Lella and whoever happens to be the passenger. Along the way you’ll meet an array of people including a former F1 racer who takes up a life of crime and womanisers who want Lella to partake in illegal street races. Generally speaking, most of the topics discussed are shrouded in controversy, with plenty of offensive slurs and derogatory terms used in a supposed attempt to match the era. It’s simply a matter of picking one of the few replies, or you can remain silent and let the story guide itself. Occasionally the characters will do their best to capture the surrounding culture, referencing well-known events such as the Sanremo music festival to the famous race at Le Mans, and casually dropping comments about the popular Italian football team, Juventus. The primary issue with Wheels of Aurelia is how the conversation between characters lacks substance. Verbal exchanges happen in a few sentences and the topic is then quickly changed to another contentious matter of the time. Characters can go from discussing thorny issues such as abortion only to switch to terrorism within a few seconds, with the pacing feeling very offbeat. The dialogue simply does not flow between characters in a believable fashion. Trying to take any matter discussed or view expressed seriously becomes quite laughable after a while because of how quickly the conversation moves along. The minimal control you have over the vehicle becomes off-putting when trying to absorb conversation – even if the story is occasionally influenced by how well you perform on the road. Though, in saying this, there are no serious consequences if you do happen to fall asleep behind the wheel. The constant bickering between the characters greatly detracts from Lella’s personal matters along with the overarching story about her and the era she is living in. Despite all the talking, every character appears to lack a deeper layer of complexity you would easily find on display in any other interactive visual novel. A lot of the conversations are repeated as well after the first play through, eroding the immersion further. At the end of each journey, Lella’s own story is essentially summarised in a few paragraphs describing what went on to happen in her life after she took a particular pathway (in both a figurative and literal sense). The issue is it’s hard to really be concerned for her wellbeing when there is no padding or depth, and each story is so short. A reward for completion of a path is normally a new vehicle, but as there are no serious penalties for bad driving, it’s no real benefit. The visuals and soundtrack in Wheels of Aurelia somewhat redeem the title’s flaws in terms of the narrative design. Overlooking the sluggish frame rate (which appears to be closer to 30fps rather than an optimal 60fps) the artwork mixes the most basic of character illustrations with a charming isometric backdrop to bring the buildings, roads, vehicles and tiny little characters on display to life. The colours are bright but also appropriately European. As Lella travels along coastlines you’ll witness bright blue seas, and in town there's plenty of conventional but grand architecture on display. Oddly, this is a hilarious contrast to the title’s bleak outlook – narrative-wise – on Italian society at the time. The soundtrack is fittingly reflective of music of the moment. It places an emphasis on the adventure with outgoing, fun and daring songs matching both the period and visuals, but not so much the title’s more prevalent mature themes. 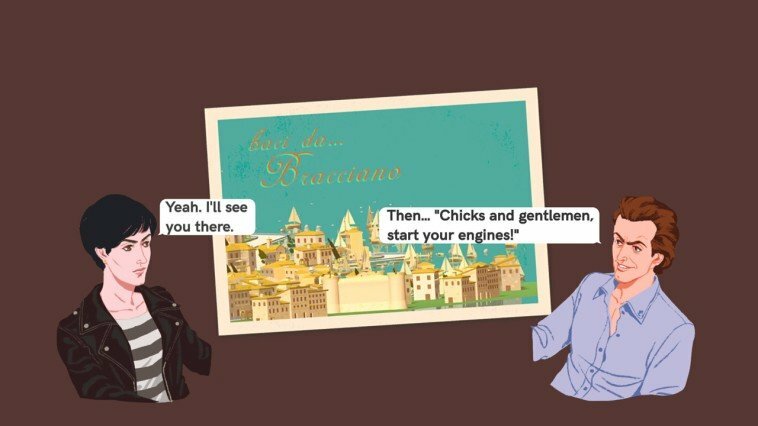 Video games and even interactive visual novels can definitely discuss important real-world issues and topics, and are a great way to re-live or re-tell the past, but unfortunately Wheels of Aurelia only wants to address a certain period in a particular country from the most extreme slant possible. There is repeatedly a one-dimensional take on the subject matter. 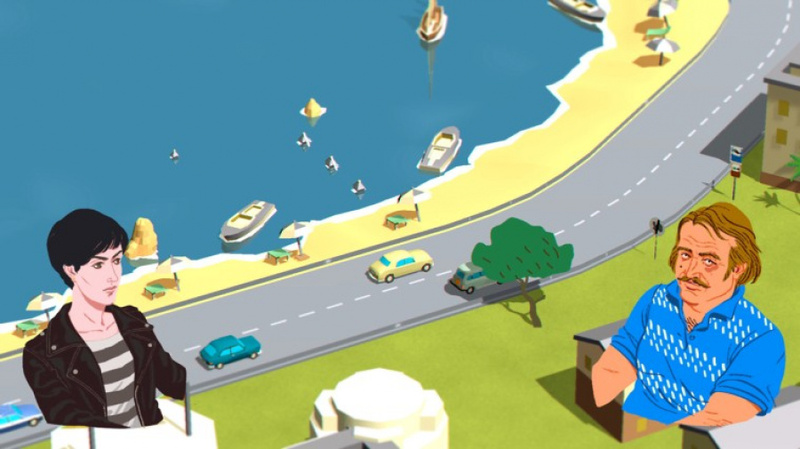 It’s conflicting how negatively this title portrays the era textually, as whilst this is happening, the main character is driving along various Italian roads soaking in the bright and sunny beaches, and enjoying the hustle and bustle of cities and towns. All is seemingly well from a visual standpoint. Intentional or not, the way the story has been manipulated and twisted makes for an unpleasant ride from start to finish. It’s not necessarily a balanced or accurate historical re-telling, either. Fortunately, you can choose whether or not to interpret the title as it is, or read against the grain. As a visual novel, Wheels of Aurelia is a lacklustre experience. As a driving game, it’s even worse. However you wish to identify it, this title lacks genuine substance; it's a solid idea executed poorly. The key themes and settings are deceptive, making the title seem like it is built on strong foundations when in reality, it’s made up of a series of convoluted verbal exchanges between characters who forcefully touch on an array of dicey topics relevant but not always central to the time. The historical-links also suffer as this information is often overridden by an aggressive sense of agenda-setting that robs the exchanges of impact. Then there’s the main narrative focused on a person you’re likely to not even care about due to the concise nature of each road trip. It’s simply not on par with the best titles this genre has to offer, and although you could argue that the esoteric nature of the game means it will illicit wildly different emotional reactions from different people, the core package just isn't compelling, challenging or appealing enough to back up that line of debate. Well the trailer looked bad so I am not surprised. Oh no! Still Italians do it better! I would rather they did an arcade racer using that art style in the title picture above, and use cars from the late 60's to early 70's. It did look pretty bad when I was looking at it in the eShop so no huge surprise. And that's fine by me, as I have way too much to play as it is. I guess.... the more games the better. Right? Wheels of Aurelia should be called... an art showcase. For art showcase it's okay but for a game it's terrible. Well, that's a shame. Game looks the part, and it'd have been nice if it was well written and fun to play on top. I don't know what you guys think, but I've seen quite a few bad scores. I hope this is not devs trying to quickly cash in on the indie boom on switch? There's nothing wrong with that but shoddy ports and bugs will not give them much validity? I liked it on PS 4!! Finally, the Criterion Collection delves into video games. At least it's not as boring as Desert Bus. @dizzy_boy I wouldn't mind a return of Interstate '76! I need to turn off my dejudder mode on my TV to check the framerate of this game on PS4. Pathetic that it doesn't run at 60 on Switch. Oh well, not buying this one. I did like all the political discussions in the game though. The driving is kinda fun too. They should have a fun little top down racing mode in addiction to bumping up the framerate to 60. @Deathwalka The review didn't say anything about it being a shoddy port, it just wasn't a great game to start with. @Dogorilla It's not just this game, there seems to be happening quite a bit, it maybe teething issue on a new system? But I hope it's that rather then rushed games to capitalise on the hype. Hi, Mauro from MixedBag here! 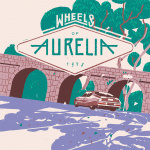 We handled the porting and publishing of Wheels of Aurelia on console. About the port: this version is 100% on par with the PS4 one visually (720p handheld / 1080p docked), but we had to cut the frame rate from 60fps to 30fps. The game is running at a stable 30fps with only some very minor hiccups. I know the game may look simple but it's actually quite heavy to run, there was no way for us to bring it up to 60fps on Switch without rewriting it from scratch, and since it's not a performance critical game it didn't really made sense. That was a damn fine well written review. @Shiryu You can find the Futuridium spaceship in Forma8! @GrailUK Oh, did not know that! @Skyrise Hey, thanks for posting the details! I went ahead and bought Aurelia for my switch and love it! My TV uses motion interpolation to make it look like 60 for, and when I played it undocked I thought it still looked great. I like the relaxed nature of this game, plus the dialogue is really interesting because I'm a political junkie!